Spinning out of the #1 New York Times best-selling BATMAN VOL. 7: ENDGAME, and SUPERMAN VOL. 1: BEFORE TRUTH by National Book Award finalist Gene Luen Yang! Now that the truth is out and world knows that Superman is Clark Kent, the one-time mild-mannered reporter is a wanted man. From the thugs of Metropolis, to the boys in blue, everybody wants a piece of Superman. And with threats to his freedom constantly closing in on him, Superman must also face a new form of evil that appears to be coming from the home of one of his greatest allies--Gotham City! But instead of finding the Batman he's known for years, Superman is met by a new Dark Knight--James Gordon! Find out whether Superman and this new Batman will be friends or foes in this, the first meeting of the World's Finest superheroes in the DCU's new status quo! 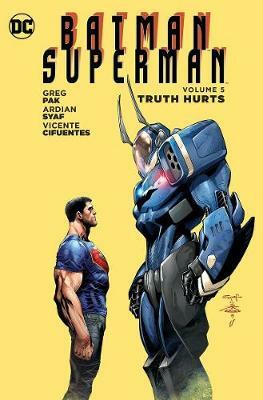 Written by acclaimed writer Greg Pak (ACTION COMICS) with art by Adrian Syaf (BRIGHTEST DAY). Collects DC SNEAK PEEK: BATMAN/SUPERMAN #1 and BATMAN/SUPERMAN #21-27.